making one sandwich, so just multiply by the number of people to feed. In Arkansas, bacon makes just about every meal taste better, however you could substitute turkey bacon for non-pork eaters. Or replace the meat entirely with sliced avocado or tomato. Change this recipe to suit your tastes, and use seasonal vegetables such as fresh spinach or kale to create new favorites. Spread softened butter on one side of each slice of bread. Spread a thin layer of Dijon mustard on the opposite side of the butter. Use Dijon on only one piece of bread. On the bottom slice of bread (with the butter and Dijon), place one slice of Provolone cheese and top with 2 strips of cooked bacon. In a skillet, fry 2 eggs leaving the yolks a bit runny (over easy to medium). Place the eggs on top of the bacon, then top with the remaining piece of bread with butter side out. On a warm griddle, cook the sandwich slowly to a nicely browned color. Do not overcook. Flip the sandwich, and slowly cook the sandwich on the other side.The goal is to brown the sandwich and slightly melt the cheese. This is like cooking a big fat grilled cheese sandwich. Remove the sandwich and cut in half. 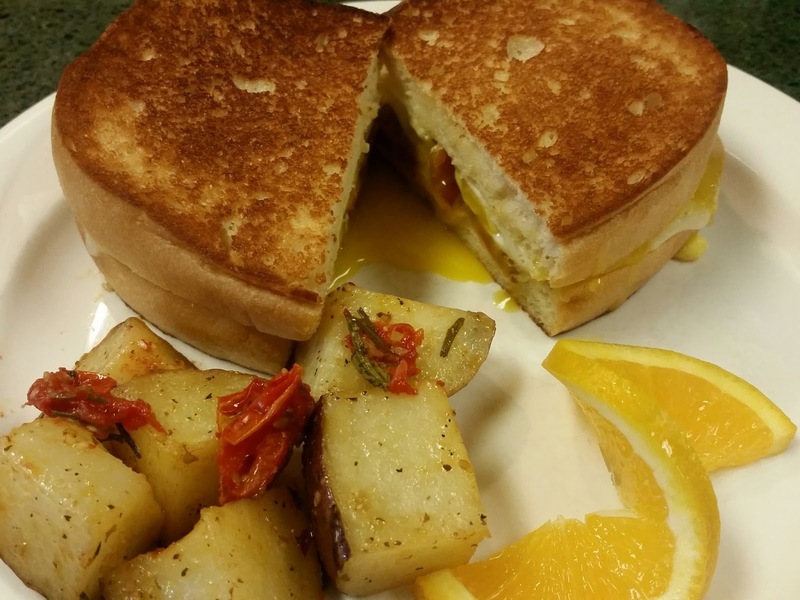 This entry was posted in French Toast Pancakes and Waffles, Lookout Point Lakeside Inn, Savory Breakfast Entrees by admin. Bookmark the permalink.